The State on Sunday responded to a petition filed with the High Court of Justice by the Almagor Terror Victims Association and three bereaved fathers against the impending prisoner exchange deal between Israel and Hamas. "As part of an agreement with Hamas, which would allow the return of soldier Gilad Shalit to Israel," the State said in its response, "there is a possibility for the release in principle of about 450 prisoners whose names are being delivered by Hamas, and whose release is being examined in detail in accordance with different considerations and based on rationales of security and values." The State added, "It should be stressed that contrary to the release of prisoners as part of a gesture and/or diplomatic agreement, this is an incident of bargaining, which can be seen as an ongoing terror attack, as part of which negotiations are being held to reach the lowest price possible as far as the State of Israel is concerned." The State went on to detail the second stage of the deal: "As a gesture to the Palestinian people, some 530 additional prisoners selected by Israel as slated to be released. The list of these prisoners has not been formed yet and no criteria have been set on this matter." The bereaved parents asked why the State was not publishing the criteria for a prisoner release as part of the impending swap deal with Hamas and why it won't stop using military censorship for free publication of reports about the deal and negotiations in a way that would allow an unbiased public dialogue on the matters requiring a decision before the deal's implementation. The State responded that "the sides have explicitly promised the foreign mediator, as a condition for the negotiations, that the details of the negotiations would remain discreet, in order to allow him to hold effective negotiations between the sides, which would not be run through and by the media." Attorney Anar Helman, who is in charge of High Court petitions at the State Prosecutor's Office, and Deputy State Prosecutor Gilad Shirman noted that past experience shows that when details of negotiations are published by the media, "this leads to a radicalization of positions on the other side, which makes it difficult to bridge between the sides and badly damage, and many even thwart, the possibility of realizing the entire purpose of the negotiations, i.e. returning the kidnapped soldier alive and well to his home and country, as soon as possible." The State's representatives added that "the military censorship is authorized to ban the publication of a certain new item, when it reaches the conclusion that publishing that item would most probably substantially damage the possibility of returning soldier Gilad Shalit." They noted, however, that it was important to have a public dialogue on the matter and that censorship would not prevent a public dialogue. The State noted that contrary to what can be understood from the petition, anyone living in the country who has been exposed to the media in the past few weeks had to be aware of the serious public dialogue taking place. "If and when the deal is formed, all the considerations and relevant information will be brought to the government for its consideration," the State said in its response. "All the considerations which guided the elements who took part in forming the deal will be taken into account, including considerations of security and values." The State called on the petitioners to include Shalit's parents in their appeal so that they could present their stand on the matter, "as they may be directly hurt if the petitioners are given what they are asking for in the petition." The High Court is expected to discuss Almagor's petition on Monday, as well as a petition filed by Knesset Member Yaakov Katz (National Union), asking that Prime Minister Benjamin Netanyahu and Defense Minister Ehud Barak publish the recommendations of the Shamgar Committee, which was appointed to discuss the principles for negotiating the release of hostages. 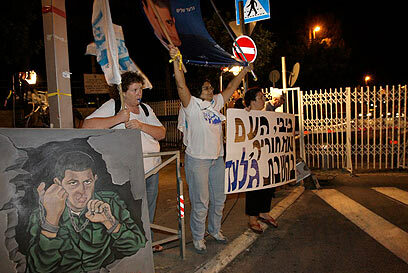 See all talkbacks "Israel: 980 prisoners to be freed for Shalit "